Our goal for this project is to build a engine driven battery charger for the off-grid home. A off-grid home is built around a battery bank, with a variety of ways to charge them. We use a combination of solar panels, wind turbines, and engine driven battery charger, the focus of this project. The battery bank then feeds a Inverter that provides “normal” 120vac house current. See the List of Materials at the end. You can calculate the HP required for a 100 Amp alternator as follows. Assume 100 Amps at a full charge setpoint of 14 Volts. V A = Watts = 1440, where V = Voltage; and A = Amps. There are 746Watts per HP and dividing 1440 by 746 yields 1.93. Doubling this for alternator inefficiency and engine aging yields 4 HP. Now add 1 HP for the belt. The final result is 5 HP. Remember that this is 5 HP at the RPM chosen. Engine manufacturers usually specify HP at the very peak possible. Such a rating is not a good indication of usable HP in a reliable setting. Derate engine specifications accordingly. We started with a 6.5 hp horizontal shaft engine and a 60amp “P“ type alternator (GM 10SI). These can be found used in a variety of machines used for gardening and kids go-karts. A vertical shaft engine could also be used. We add an alternator bracket, a pulley, and a belt. We took the engine and the alternator to the hardware store so that we could test fit the bolts needed to assemble the project. We used 4 bolts for the legs, with 2 flat washers, one lock washer, and nut for each of the leg bolts. Another 4 bolts, with lock washers for bolting the alternator bracket to the crankshaft face, and two bolts for the alternator, one with 2 flat washers, a lock washer and a nut, the other with a flat washer and a lockwasher (the case is threaded, no nut). We picked a tossed aside shelf from an old department store screw together furniture project as a base for this project. Take a sheet of paper and place it on the bottom of the engine. Poke a pencil through the mountings holes on the bottom of the engine to create your mounting hole template. Then place the paper on the board, and drill the mounting holes. Now bolt the engine to the board, with the bolt heads and a flat washer on the bottom of the board, and flat washer, lock washer, and nut on the engine legs. We used round head bolts, but next time I’d use hex head to keep the bolts from turning when tightening. Next, we take the alternator bracket, and bolt it to the engine, using 4 bolts with lock washers. Then slide the pulley onto the shaft, with the key inserted, and slightly tighten the Allen screw. 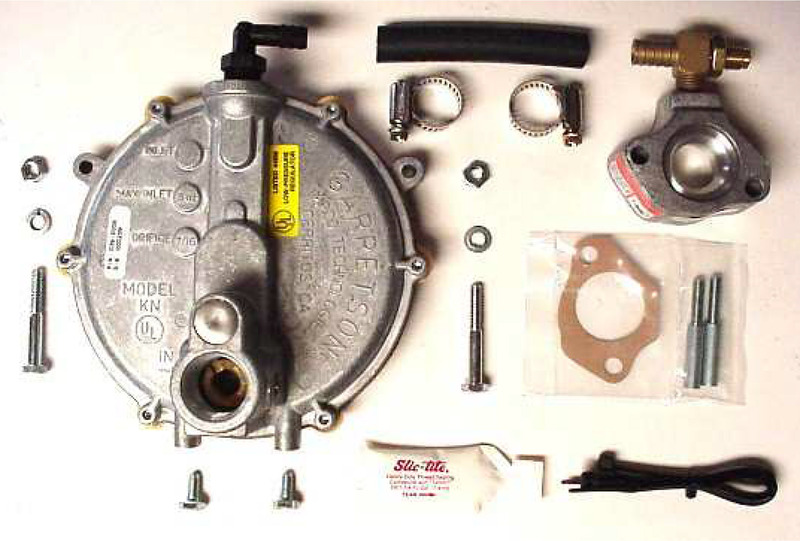 The pulley will be adjusted once the alternator is installed. Now bolt in the alternator with the two alternator bolts. Install the belt, and adjust the tension, and tighten down the alternator. Depending on your alternator, you may have to install a 10 ohm 10 watt resistor between the number 1 terminal on the alternator and an ignition source to properly excite the alternator. For enhanced charging, install an externally regulated “P” type alternator, and use a 3 stage charge regulator. See Appendix 1. Install a ah meter like a Trimetric from Bogart Engineering between the battery and all loads and charging devices to monitor the amount of electricity generated or used. See Appendix 2. For a battery, we used a Type 27 Deep cycle from Walmart. This is a 12vdc quasi deep cycle that will work for this project. A Optima Yellow Top would a better option. We then connect a 400 – 700 watt inverter (you can use a larger one if needed) to provide the 120vac house current. Connect a solar panel (or array of solar panels) with a charge controller to the battery, to reduce engine run times. We recommend a Harbor Freight 45 watt kit(s) for this project and Sunguard 4 amp charge controller(s) (Do not use the HF included controller). The 400 watt wind turbine with 60 watt PhotoVoltaic array and inverter would be ideal. A propane conversion kit can be added to eliminate gasoline usage, reduce the risk of Carbon monoxide poisoning, and clean up emissions and increase convenience. A grill bottle or regular house sized propane system works fine. See Appendix 3. The Ample Power Smart Charger will maintain a bank of house batteries with 3 stage charging and temperature compensation, as well as maintain the starting battery as an isolated device. – Assortment of bolts, nuts and washers from hardware store – metric if using the HF engine.